At the heart of any attempt to foster a culture of innovation is creative thinking. 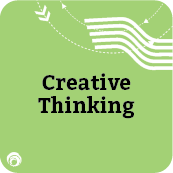 In this interactive workshop, we explore creative thinking principles and focus on how your capacity to balance ideas with analysis can boost or block creativity on your teams. Participants learn simple and effective guidelines for thinking, along with strategies for improved brainstorming. In addition, we’ll highlight an extremely effective thinking process called POINt that will transform the way your team asks for and gets feedback on ideas and work products.